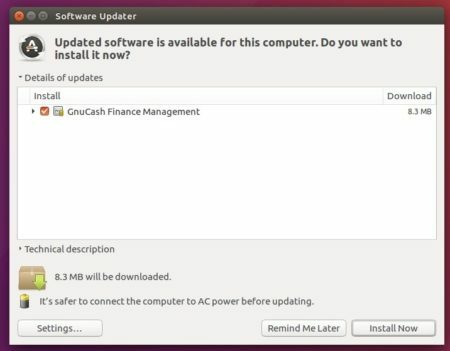 Free accounting software GnuCash got a new update recently for its 2.6 stable series. Calendar of upcoming SXes has various display issues. Interdependent report options fail to change state after using apply for a limited number of times. Set Invoice/Bill items date correctly from imported CSV. unifying “Clear the entry.” tooltip on Loan Repayment Calculator. Persian currency symbol is doubled. Fixed errors from loading init.py. Run the python bindings tests in a CMake build. Implement dist, distcheck, and uninstall targets for CMake build. The GetDeb repository contains the most recent GnuCash packages for Ubuntu 16.04, and Ubuntu 17.04, though the 2.6.18 is not available at the moment (Be patient, it will be available in a few days). For Linux Mint 18.x, replace $(lsb_release -sc) in the code with xenial. To remove GetDeb repository, launch “Software & Updates” utility and navigate to Other Software tab.